Richie Commins, founder Dashcabz, one of the twenty finalists put forward to the public vote phase of the Nissan Generation Next ambassador programme 2017. A 23-year-old tech graduate from Galway who has created an app that allows students to get a taxi to get home safely, even when they have no cash, bank card or phone, is in the driving seat to become a Nissan Generation Next ambassador. Richie Commins from Claregalway is now just one step away from landing the keys to a brand new taxed and insured Nissan to drive for a year having been named as one of 20 finalists put forward to the public voting stage of the competition. He was one of almost 1,000 people who applied to the innovative ambassador programme which helps people to follow their dream and to get ahead with the backing and support of Nissan. 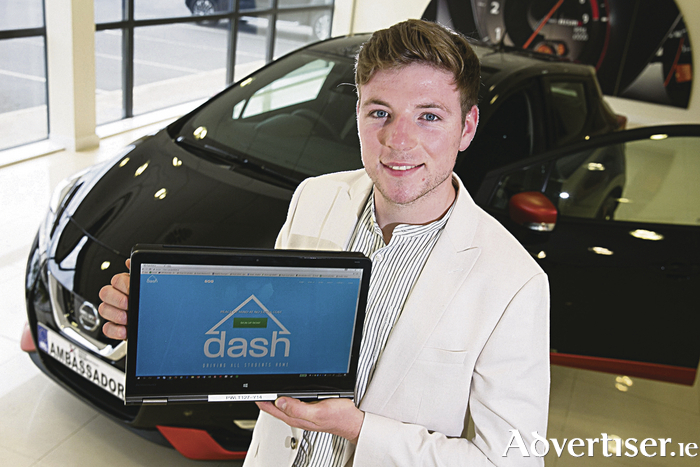 Richie’s started his business DASH while studying for a degree in Business Information Systems at NUI Galway. Over 8,000 students have already signed up to create an online account at www.projectdash.ie where they can add their photo ID and bank details to create a unique four-digit pin. Students using the innovative service can simply present participating taxi drivers with their name and four-digit DASH (Driving All Students Home ) pin. Taxi drivers who have downloaded the DASH app can then use these details to verify the identity of the student and to process the taxi fare upon arrival at the student’s destination. “We have received an amazing response from students and taxi drivers. We started with a pilot project in Galway and we are now rolling out the service to colleges and taxis drivers across the country. Our platform is extremely scalable around the world,” said Richie. “Students are signing up because it gives them a way to get home safely without needing cash, a bank card or a phone. Taxi drivers and taxi companies are signing up because we are the only platform in the market that ensures that they get paid when students find themselves in that position,” he added. Richie has already received a number of business awards for DASH while AIB have supported him with office space in Galway. He has also partnered with Romanian tech genius George Grama who brings real depth of experience to DASH with a track record of having developed taxi apps that scaled across Europe. “I am thrilled to make it through to public voting phase of Nissan Generation Next. Every vote counts and I hope that the people of Galway will support me by voting online. I have big ambitions and securing the keys to a brand new Nissan would really help me to realise its potential,” he added. Local Nissan dealer, Windsor Galway Nissan are encouraging everyone to get behind Richie and to vote for him online at www.nissangenerationnext.ie before voting closes on 14th July. The top seven vote-getters get to become Nissan Generation Next ambassadors, while the judges at Nissan will select the final three ambassadors for 2017. “Richie exemplifies what Nissan Generation Next is all about. He is fearless about bringing his dreams and ambitions to life and making a success of DASH. We are proud to support Richie and encourage everyone in Galway to get behind him and to vote for him online,” said Michael Butler, Sales Manager, Windsor Galway Nissan.